Seems like with just a glance at your phone, computer or tablet—suddenly an hour has passed and you don’t even know where the time went. It happens to everyone. But here’s the deal: either your phone is an awesome productivity tool or a total distraction. Your choice. Fortunately, there are tons of awesome smartphone apps out there to really help you use your phone for GOOD. I swear, with these apps you'll get more done, save money, save time and boost your productivity all from your handy-dandy smartphone! 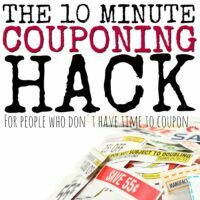 Whether you’re a blogger, running a small business or running your household as a mom, you don’t have time for distractions. If you want success you’ve got to maximize the tools at hand. The great news is there are tons of smartphone apps to help you get a jump on your productivity! You’ll save time and money, plus you'll even be able to be more successful at sticking to your goals (like losing weight). Now, I don’t want you to run out and download every app I’ve listed here. Just pick like one or two! Some of these are better for bloggers, while others are good for helping you save money or get in shape or achieve other goals. Look through the list, compare them to your own goals, download a few and see which work for you. 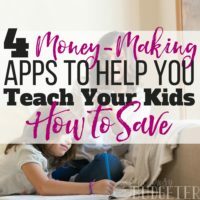 Here are the best time and money saving smartphone apps I’ve found to boost productivity and help me get more done! Credit Karma is a credit monitoring app to help you stay on top of your finances and check your credit score. If you’re building up your credit (like, if you’re saving up for a mortgage) this is a great tool to help you keep an eye on your progress. They offer credit monitoring so you'll quickly find out about identify theft and other concerns. They'll suggest credit cards and other resources based on your progress (so if you’re tempted by credit card offers, prepare yourself), but it's a great free tool to help you get a handle on your credit situation. Ibotta is a cool app offering you rebates on your purchases at tons of different stores—the grocery store, Target, Walmart, and more. You earn rebates when you purchase certain branded products or even for simply purchasing regular “any brand” basics such as eggs, bread and milk. The rebates are small (a few cents, usually) but they add up fast, and you have the option to receive cash back via PayPal or Venmo, or use your earnings toward gift cards. You do need to take a picture of your receipt and the UPC symbol on items you purchase, so it takes a few minutes to enter, but the instructions are easy to follow. If you go out to eat and are splitting expenses with a pal, it’s totally awkward to calculate out who owes what, right? Well, Splitwise is a free app to do all the number crunching and adding for you. You won’t stress about who owes who and how much. This is also a great option for roommate situations and other times when you’re sharing expenses. Each person receives and easy IOU reminder and a running total of what they owe right on their phone. Super simple. So, I love customer loyalty programs (of course) but who wants to carry around extra pounds of little plastic key fobs on your keychain? If you take them off, you never happen to bring the right card when you need it. Then you lose them. If you opt for the credit card size cards, then cards clutter up your wallet. Stocard is amazing because you eliminate all those little key chain danglers, and store all the information right on your smartphone! (OK, I'm cheating: not an app, but a cool tool nonetheless.) The NerdWallet retirement calculator helps you figure out exactly what you need to put away each month, based on what you earn now and your retirement goal. It’s pretty sobering when you realize you’re on track to retire at 80, but it’s also very motivating as you realize with a little bit of effort you will retire with all the funds you need. WhatsApp is a free communication tool. It works particularly well for sending free texts and messages (along with photos) to family and friends. If you hate paying for text messaging on your phone, WhatsApp helps you save money and communicate with anyone else who has the app. You can even use WhatsApp to call for free (although your data rates still apply). You can enjoy group chats and it works wonderfully for family and friends who are overseas. WhatsApp may take time to get used to, but once you do, it’s an awesome way to stay in touch. Viber uses VOIP technology and works similarly to WhatsApp, in that it’s a free communication app. You can send texts, conduct voice calls (calls to non-Viber users cost money) and share messages from your smartphone. Viber also offers the ability to use their service over your computer, as well as switch back and forth from computer to phone. Rise is an amazing app to help you lose weight and meet your nutrition goals. The premise is simple: you snap a photo of your meal. A nutritionist or dietitian analyzes what you’re eating and helps you make better choices. Your nutritionist may suggest little changes to your meals to help meet your calorie and weight loss goals. You can also work with their coaches to construct a fitness plan that works for you—you’re accountable and with constant check-ins and reminders, you get the benefits of a personal trainer (without the price). At $48/month, this service isn’t for everyone, but it is cheaper than a traditional trainer and dietitian and does provide great motivation and one-on-one support. If the price of Rise is prohibitive for you, consider MyFitnessPal. You will need to be a little more self-motivated, BUT this free app is easy because you can literally find and track any food in their huge database. Monitor your progress as you go along. When you join MyFitnessPal you’re given access to an online community of fellow trackers who will help you brainstorm ideas of what works and what doesn’t. Find recipes and other helpful info in the community pages. Tap into corresponding fitness apps, listed on the MyFitnessPal site, like MapMyRun to help you track and plan workouts. Do you like mixing up your workout routines? Does running on the treadmill bore you to tears? Do you sit a lot at your job? (Hello, bloggers, I feel ya!) Well, Zova is a great app to counteract all of those pain points. This app offers a bunch of different workouts, with the ability to upgrade to premium ($8.99/month) for access to even more workout routines and ideas. The price is still much cheaper than a gym membership. The variety gives you the ability to pinpoint what workouts really help you stay motivated. There’s literally a workout for everyone. Headspace is app-based meditation training, which is historically and scientifically proven to reduce stress and help with mindfulness. The Headspace app offers a free 10-day trial and then you’re given the option to continue at a rate between $7.99 and $14.95 per month. Headspace walks you through simple meditation exercises to help you sleep and relax better, and keep your stress under control. If you’re considering meditation, this app is a great way to get started. Stop, Breathe & Think is a simple, free app offering you options for different guided meditations based on your current physical and emotional state. After a quick “check-in” you choose your guide and walk through a 5-10-minute meditation to help you relax, feel calmer and focus on the task at hand. This app offers premium upgrades for $5.83-$9.99/month where you’re able to unlock more guided meditations and exercises. Asana is a project management tool allowing you to collaborate with other people on a project. This is great for bloggers and those running a business, because you can work with everyone on your team in one place. Assign tasks and manage who’s working on what. Similarly, Trello is also a project management tool. Both offer strengths and both cost $8.33/month for the premium version (the basic versions are free). Trello’s a bit more visual, Asana’s more “list-based,” so depending on your work style you may prefer one over the other. Fortunately, you can integrate Trello with Asana, so you can work across the two different apps and collaborate with users of both. If you’re dealing with customers, contracts and are running a small business, SignNow makes your life way easier by offering an electronic signature option that actually works. We’ve all had the experience of attempting to drag a picture of our signature onto a document, only for your name to turn out funky and illegible. For $5, SignNow offers an easy-to-use service that integrates with most of the software (like Microsoft Office) you’re using already. Pocket is an awesome app where you’re able to save any clip, article or bit of information you like to refer to it later. You can save text from Twitter, images, articles, links, a quote, or any bit of data that strikes your fancy. If you’re looking for inspiration for your blog, or if you don’t have time to read a post or article now but want to check it out later, Pocket is a great way to save all the information to review when you have time. The basic service is free. Evernote is a great organization app for note-takers, list-makers, and those who want to remember information without having to save bits of information here and there. Handwritten notes, audio recordings, lists and more are all searchable and accessible with Evernote. Share your notes with others, search for snippets of text and store all your brainstorm “stuff” in one place. The basic version is free, and runs up to $69.99 per year (more for business accounts). Any.do helps you keep track of tasks, lists and schedule reminders across your computer, phone and tablets. You’re able to set up your to do list, with action items and suggestion to complete your tasks. With Any.do you’re given the option to schedule reminders and tasks as calendar items or to simply keep them on a list to quickly see what you need to achieve and to get more done. Have you ever “scanned” a document by taking a photo with your phone and then attempting to pass it off as “scanned?” The document always turns out sort of…unclear and less-than-professional looking. Well, CamScanner helps you scan documents, email them right away or organize them as pdfs into files to access later. This app turns your smartphone into a scanner for free. You can also invest in a premium or business account for up to $6.99/user/month, to help you scan and store all your documents. Weekdone is a team goal-setting software that gives you an overview of your team projects at a glance. You can use the app as a single user as well, and it’s free for up to three people. Weekdone give you a weekly overview of where your project stands and how close you are to meeting your goals. This app is great for blogging, small business goal-setting and planning. If you struggle with getting up in the morning, Alarmy is the most terrible, wonderful app to help. Alarmy requires you to take a photo of a pre-determined item (like your bathroom sink), solve a series of math problems or shake your phone, to shut off your alarm. Is it annoying? You betcha! Does it work? Yup. You will definitely get up and at ‘em after the alarm goes off. This very effective app is $1.99, well worth the money for those who can’t get up in the morning. Forest is a simple productivity app to keep you from looking at your smartphone. If you often get distracted by checking your phone when you’re supposed to work, the Forest app lets you plant virtual trees that grow if you don’t touch your phone. Look at your phone? Your tree dies. As users grow trees they earn coins which are used to purchase more virtual trees OR real trees to plant in areas where they’re needed. Forest app is free, cute, and pretty motivating to put down the phone. Ever wonder how long you’re spending on social media versus how long you’re actually being productive? RescueTime lets you set alerts so you know how long you’re spending on apps, websites and other possible time-wasters. It works on both computer and phone. 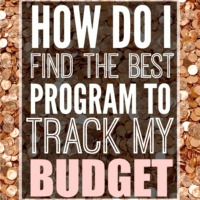 Use the program to get a picture of what your time looks like, set goals for productivity and view three months of productive time. With the premium version, you’re able to block less-productive websites (or set up a timer) and track how your time is spent away from the computer. The premium version is $9/month or $72/year. If you’re wondering where your time goes, this will tell you! Okay guys, I love scrapbooking, how about you? I was one of those old school scrapbookers back in the day and I seriously love photos, but sadly, I don’t always find the time for scrapbooking anymore (I wish). Chatbooks is a totally easy app to create ridiculously cute little photobooks based on your Instagram and social media photos. The best part is your captions and dates are saved with your photos. It takes a few minutes to set up the app, and then for $8 a photo book gets sent to you every time you’re up to 60 photos. It’s a great way to capture memories and they’re nice gifts too. There are tons of productivity apps out there to help you do all kinds of jobs more efficiently. Get organized, sort your to-do list, plan your meals and workouts and even become more mindful and relaxed! 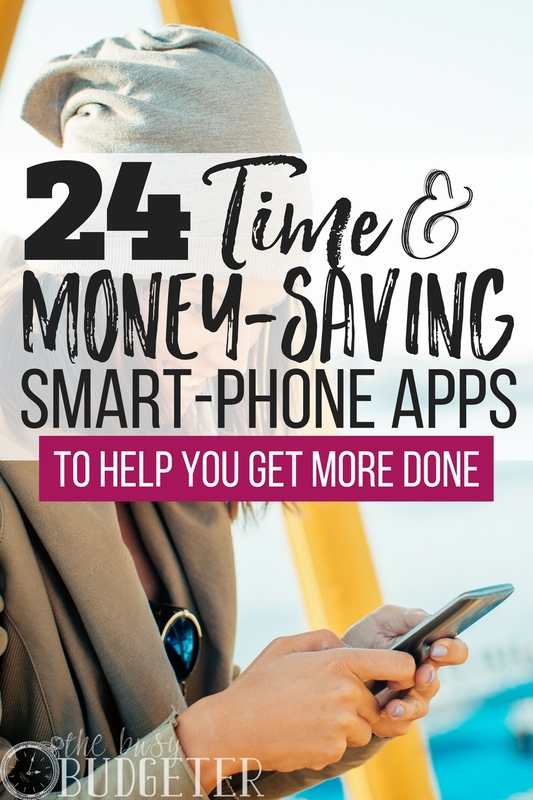 So, the next time you feel your phone is a distraction, check out these apps to boost your productivity, focus and help you save time and money. 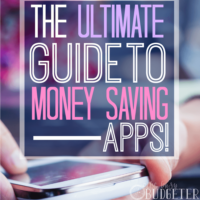 What are your favorite time and money-saving smartphone apps? Are there any you can’t live without? This is great List! Right now i am using one or two a and its very helpful for you. I use Evernote a lot to organize mom life and file stuff, while Asana helps me plan my work-at-home tasks. Another free Android app I find helpful is “Brain Focus”. It lets me design my working days with working sessions and breaks as suggested by the Pomodoro technique. That way I can stay on track and focus on the tasks that need to get done! Thank you so much for sharing all of these apps. I have not heard of most of them so I will defiantly check them out. I have just started using ibatta and would encourage anyone else to try them out! Its so fun to see what you can get money for! Thank you so much for sharing all of these apps. I use Splitwise mostly. It is a very user friendly app. You can easily get it on your android and iPhone. Read the articles you will easily get to know how the app works. Thanks for sharing such a great piece of information with us I really appreciate that.